Although the Owl Fire has been contained and personnel demobilized, the Beaverdam, Columbine 1, and new Promontory Complex are burning rapidly. 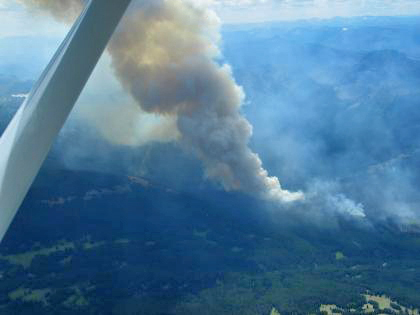 All three are SE Yellowstone backcountry fires. Folks will recognize The Promontory, which sticks out into Yellowstone Lake. It is on fire. Here is the Park’s wildfire page. The Inciweb Page is usualy better, but it is overloaded and hard to access due to the demand for fire information. Beaverdam Fire. Credit Yellowstone National Park. Columbine 1 Fire. Updated on August 13, 2007. Text is now correct.